Before the plants and flowers will flourish in the garden, weeds must be rooted up, otherwise all the labours of the gardener will come to naught. As the Lord taught so plainly in the parable of the Sower, where the thorns are permitted to thrive, the good Seed , the Word, is choked (Matthew 13:22). Christ defined the thorns as the cares of this life and the deceitfulness of riches, the lust of other things and the pleasures of this life. If these things fill and rule our hearts, our relish for spiritual things will be quenched, our strength to perform Christian duties will be sapped, our lives will be fruitless, and we shall be like weeds. This is why the first call in Hebrews 12:1 is “Let us lay aside every weight”. Inordinate care for the present life, and fondness for it, is a dead weight for the soul that pulls it down when it should ascend upwards, and pulls it back when it should press forward. It is the practical duty of mortification that is emphasized, the abstaining from fleshly lusts which war against the soul (First Peter 2:11). Undue concern over temporal affairs, inordinate affection for the things of this life, the intemperate use of any material blessing, undue familiarity with the ungodly, are weights which prevent progress in godliness. The cloud of witnesses is not the object on which our heart is fixed. They testify of faith, and we cherish their memory with gratitude, and walk with a firmer step because of the music of their lives. (Compare it to the cheering of the crowd- the supporters’ club). Our eye, however, is fixed, not on many, but on One, not on the army, but the Leader, not on the servants, but the Lord. 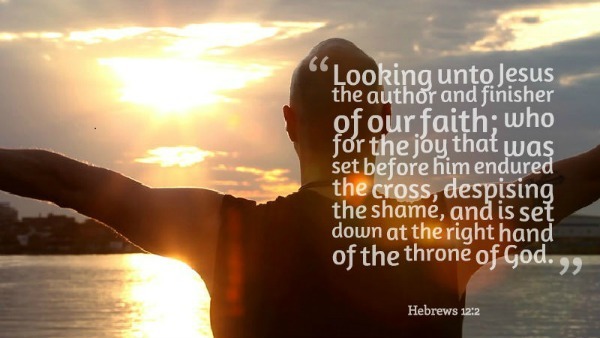 We see Jesus only, and from Him we derive our true strength, even as He is our life and light. Jesus is the supreme Example for all people in the race. He is not here presented as one of those in the race; He is the Object of their faith. He is the One, who Himself began and completed the whole course of faith. He is the One perfect Example of Faith and witness of what Faith really is. It was for the joy that was set before Him that He ran the race; His enduring the Cross was the most complete trial and most perfect exemplification of faith. In consequence he is now seated at the right hand of God, as both the Pattern and Object of faith. He has given us one promise “to him that overcomes, I will grant to sit with Me in My throne even as I also overcame, and AM sat down with My Father in His throne” (Revelation 3:21). In this verse, the Saviour is represented as the Leader of all the long procession of those who had lived by faith, as the great Pattern for us to imitate. Yes, the life which Jesus lived here upon earth was a life of faith. By faith, He walked, looking always unto the Father, and speaking and acting in complete dependence on the Father. By faith, He looked away from all discouragements, difficulties, and oppositions, committing His cause to God who had sent Him; to the Father, whose will He had come to fulfill. By faith, He resisted and overcame all temptation, whether it came from Satan, or from the false Messianic expectations of Israel, or from His own disciples. By faith, He performed the signs and wonders, in which the power and love of God’s salvation were symbolized. Before He raised Lazarus from the grave, He, in the energy of faith, thanked God who heard Him always. And here we are taught the nature of all His miracles: He trusted in God. He gave the command, “Have faith in God” out of the fullness of His own experience. This same Jesus is the One we are being enjoined now to look to for direction, strength and power we need to run the race before us. The race that is before us is a race that can only be run in faith. What actually are we being asked to do? It is to live a life of faith. What does this entail? A life of faith is a life lived in complete dependence on God. A life of faith is a life lived in communion with God. A life of Faith is a life lived in obedience to God. A life of Faith is a life of assured confidence in the unseen future. And so dear brethren, this Jesus , in the absoluteness of His dependence upon the Father, in the completeness of His trust in Him, in the submission of His will to that Supreme Command, in the unbroken communion, which He held with God, in the vividness with which the Unseen ever burned before Him, and dwarfed and extinguished all the lights of the present and in the respect which He had, unto the recompense of the reward; nerving Him for all pain and shame; has set before us all the example of a life of faith, and is our Pattern as in everything, in this too. It is worth considering in the light of the life of faith as shown in the Man Christ Jesus, if there is any real Christianity in the world today. Christianity consists in being conformed into the image of God’s Son; “Looking unto Jesus” constantly, trustingly, submissively, lovingly; the heart occupied with the mind stayed on Him – that is the whole secret of practical Christianity. What are the things which hinder us running? An active Devil, an evil world, indwelling sin, mysterious trials, fierce opposition, afflictions which almost make us doubt the love of the Father? Then call to mind the great cloud of witnesses. They were men of like passions with us; they encountered the same difficulties and discouragements, they met with the same hindrances and obstacles, but they ran with patience, they overcame; they won the victors’ crown. How? By looking unto Jesus “esteeming the reproach of Christ greater riches than the treasures of this world; for He looked to the reward.” (Hebrews 11:26) But more; look away from difficulties, “and not being weak in faith, he did not consider his own body, already dead, since he was about a hundred years old, and the deadness of Sarah’s womb. He did not waiver at the promise of God, through unbelief, but was strengthened in faith, giving glory to God, and being fully convinced that what he had promised He was also able to perform.” (Romans 4:19-21) Look away from self, from fellow racers; but look to Him who has left us an example to follow, in whom dwells all the fullness of the Godhead bodily, so that He is able to succour the tempted, strengthen the weak, guide the perplexed, supply our every need. Let the heart be centred in and the mind stayed upon Him. The more we are looking unto Jesus, the easier will it be to lay aside every weight. It is at this point that so many fail. If the Christian denies self of different things without an adequate motive for Christ’s sake, he will still secretly hanker after the things relinquished, or before long return to them, or become proud of his little sacrifices and become self righteous. The most effective way of getting a child to drop any duty or injurious object is to proffer him something better. The best way to make a tired horse move more quickly is not to use the whip, but to turn his head towards home. So, if our hearts be occupied with the sacrificial love of Christ for us, we shall be constrained thereby to drop all that which displeases Him; and the more we dwell upon the joy set before us, the more strength we shall have to run with patience the race that is set before us.